AutoResponder profiles control two things: the email that is sent to the user after the form submission, and the thank you page that they see. The thank you page can be a page that you create with the Logiforms editor, or a redirect to a URL that you specify. There are three types of AutoResponder Profiles: Standard, Follow-up Sequence, or Respondent Updates. The first two can be set as default, but since the primary use for a Respondent Update profile is to encourage returning to a form, you cannot set it as default profile. You can create a single AutoResponder profile, or create multiple profiles and use rules to determine the correct response/profile to use. If you have multiple profiles, the first match based on your rules is delivered. If you have no rules defined or no rules match, the default profile is used. If your business requirements are such that you need to send many different email responses, consider using triggers. In Form Designer, from the Post Processing menu, choose AutoResponder Emails & Redirects. Or you can right-click the form in the Dashboard, then select Form Design Tools > AutoResponder Emails & Redirect Options. Confirm that you are in the correct wizard and click Next. Choose the type of AutoResponder you want to create and click Next. 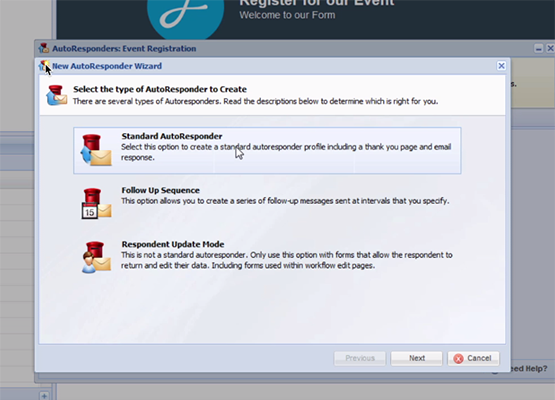 Learn more about Standard, Follow Up, or Respondent Updates autoresponders. If you choose the Follow-up profile, the Follow-up message management window will appear next. Learn more in the Follow-up Sequence topic. In the Profile Settings panel of the wizard, give the profile a meaningful name. If this is your first profile, the Default Profile checkbox will already be checked This field becomes relevant when you have multiple AutoResponders and rules. Your default profile is used when none of the rules match. Optionally, you can enter a Redirect URL that the user will be redirected to after form submission. Leave this field blank if you plan to create a thank you page. If your form is embedded on a web page using the embedded integration method, and if you are using a redirect, click the Redirect Inside Embedded Frame checkbox to do the redirect inside the embedded frame. Select Update Mode Enabled if you want to use this profile when a new form is submitted and when a form is updated by respondent update mode or a workflow edit page. By default, the Email Settings checkbox is selected and all the fields on this panel of the wizard are visible. If you do not want to send an email to users who submit your form, uncheck this setting and click Next. Your users will only see a Thank You Page which you configure in the next step of the wizard. In the Email Field click in the dropdown list and choose the field on the form which has the user's email address. If you want to attach a PDF to this email, click in the dropdown list of the PDF Attachments field and choose one or more PDF documents. In From Address, enter the source email address that you want to appear in the header of the email message. Click the wildcard icon to insert wildcard values into this field. In the From Name field, enter the name that you want to appear in the header of the email message. Click the wildcard icon to insert wildcard values into this field. In the Email Subject field, enter the subject to appear in the header of the email message. Use the wildcard icon next to the subject field to personalize the subject line. Click Launch Email Editor to open the Text Editor and craft the message that will appear in the body of your email. Click Save to return to this panel. If you selected the Include Alternate Lookup Data checkbox, see Using Lookup Data to add Lookup Data to the body of your email. Click Next to move to the next panel of the wizard. If you did not specify a redirect URL in the Profile Settings step of the wizard, then you must place a message in the Thank You Page editor. Optionally, check the Use Form Page Layout checkbox to use the forms page layout on your Thank You page. The border, header, and footer will match the style you have defined on your form. Optionally, check the Break Frames on Link Click checkbox if you are using an embedded form, and you want any links on your thank you page to break out of the frameset and reload the entire page. Click Launch Thank You Page Editor to open the Text Editor and craft the message for your Thank You Page. Click Save to return to this panel of the wizard. If you selected the Include Alternate Lookup Data checkbox, see Using Lookup Data to add Lookup Data to your Thank You Page.